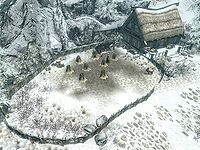 Brandy-Mug Farm is a wheat farm, a short distance east of Windhelm Stables. It is a modest single-roomed farmhouse, that is home to Bolfrida Brandy-Mug. As you approach the farmhouse from the road there is a blue mountain flower to the right of the path to the front door. In the fenced off field beside the farmhouse Bolfrida cultivates eight bushels of wheat and a large number of snowberry bushes. In the field, there is a chicken coop, along with two chickens, a goat as well as a wood chopping block to the rear of the field and a grindstone by the farmhouse. Upon entering there is a set of shelves on your left, against the north wall holding two leeks, a bulb of garlic, three potatoes and several pieces of cheese on top. On the floor to the left is a basket containing two more leeks and hanging from the ceiling above are two garlic braids, three bunches of dried elves ear and a bunch of dried frost mirriam. In the northeastern corner there is a barrel containing foodstuffs and coming out from the center of the east wall is an owned double bed with an unlocked chest containing minor loot at the foot of the bed. In the southeastern corner is a round wooden table holding two bottles of Black-Briar mead and against the south wall a tall wardrobe containing clothes with a rack hanging from the ceiling to the right holding three rabbits. In the middle of the south wall, opposite the entrance is a fireplace with a cooking pot in front and on the mantelpiece is a copy of the Alteration skill book Daughter of the Niben. To the right of the fireplace, also against the south wall is a long wooden table and bench with a bottle of Nord mead, a bottle of alto wine, a bottle of wine, a cabbage, several loaves of bread, a salmon steak, a potato, an eidar cheese wedge and a sprig of snowberries. Under the table is a potion of vigor. In the northwestern corner is a square wooden table and two chairs with four more sprigs of snowberries on top. Esta página foi modificada pela última vez à(s) 23h52min de 7 de novembro de 2014.